Terms such as "simulated time", "simulation time", "virtual time", "logical time", and "real time" appear throughout the modeling and simulation literature as a means of describing the timing, ordering, and/or processing of events. Unfortunately, this vocabulary can become a source of confusion due to subtle inconsistencies in how the terms are interpreted. 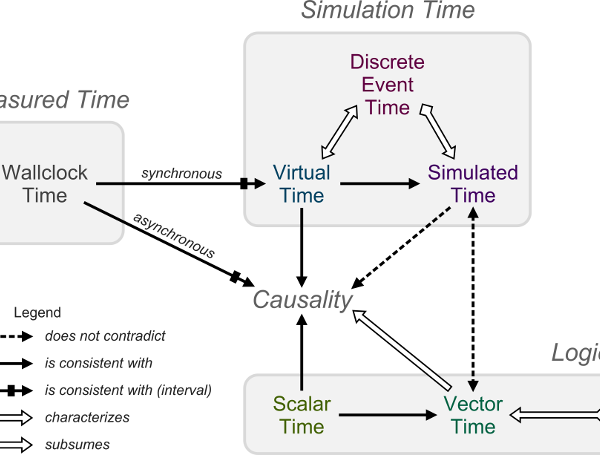 Here we review mathematical representations of event times, identify their formal relationships, and present a taxonomy to clarify the proper meanings of the most common notions of time in a simulation context. For example, the taxonomy indicates that while both scalar logical time and virtual time feature a property called causal consistency, virtual time differs in that it is formally consistent with simulated time. We also argue that while simulated time is a form of simulation time, the two terms should not be used interchangeably. A thorough look at the various event time representations suggests new research opportunities, such as the repurposing of distributed computing techniques for debugging both parallel and sequential discrete event simulations.